The Weeping Icon of St. Irene Chrysovalantou is venerated at St. Irene Chrysovalantou Greek Orthodox Church in Astoria, Queens, New York City. 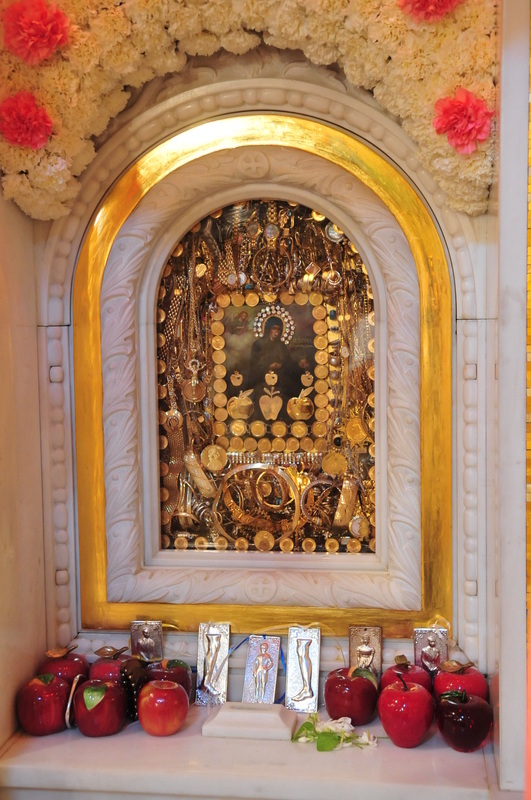 This Icon of St.Irene Chrysovalantou is said to have wept preceding and during the Persian Gulf War. The weeping began on 17 October 1990 while the icon was on loan to the Greek Orthodox Church of St. Athanasios and John the Baptist, and continued to weep after being returned to New York. There have been many Miracles surrounding this holy Icon. This Icon was painted by an Orthodox monk on Mt. Athos, Greece, in 1921. Metropolitan Paisios of Tyana, abbot of the monastery in Astoria, N.Y, who accompanied the Icon to Chicago, brought it to the United States in 1972. St. Irene was an Orthodox nun in 9th century Turkey. As the story goes, she was a beauty with long, blond hair. The Turkish king was looking for a wife and summoned her to the palace, said Sister Christonimfy Fitzpatrick, an Orthodox nun from the Shrine of St. Irene Chrysovalantou who traveled with the Icon to Chicago. On her way to see the king, St. Irene met a religious ascetic, or holy man, on Mt. Olympus, who told her she should join the Convent of Chrysovalantou. By the time she arrived at the palace, the king was already married. So she went to the convent and became a nun. St. Irene was known for her humility and eventually became abbess of the convent. As the story goes, an angel appeared and presented her with three apples from heaven. She ate the first one in tiny pieces over 40 days, cut up the second and gave pieces to other nuns who were sick, and they were healed. She ate the last apple just before her death at age 106.